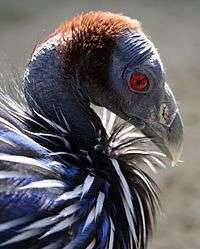 The vulturine guineafowl is a large (61–71 cm) bird with a round body and small head. 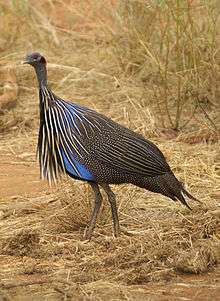 It has a longer wings, neck, legs and tail than other guineafowl. The adult has a bare blue face and black neck, and although all other guineafowl have unfeathered heads, this species looks particularly like a vulture because of the long bare neck and head. ↑ BirdLife International (2012). "Acryllium vulturinum". IUCN Red List of Threatened Species. Version 2013.2. International Union for Conservation of Nature. Retrieved 26 November 2013. Wikimedia Commons has media related to Acryllium vulturinum.